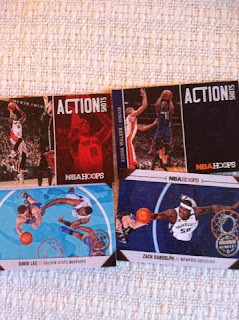 BASE CARDS: Kicking off the 2013-2014 NBA card season if Panini Hoops. 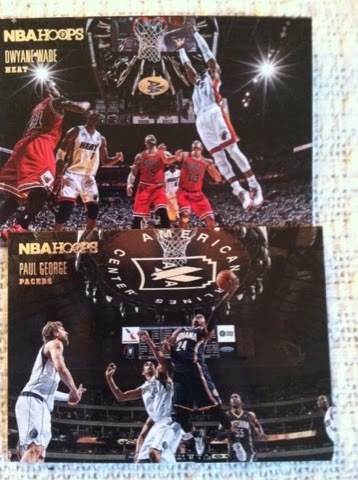 This years Hoops has proven to have some great photography in a classic throwback feel design. 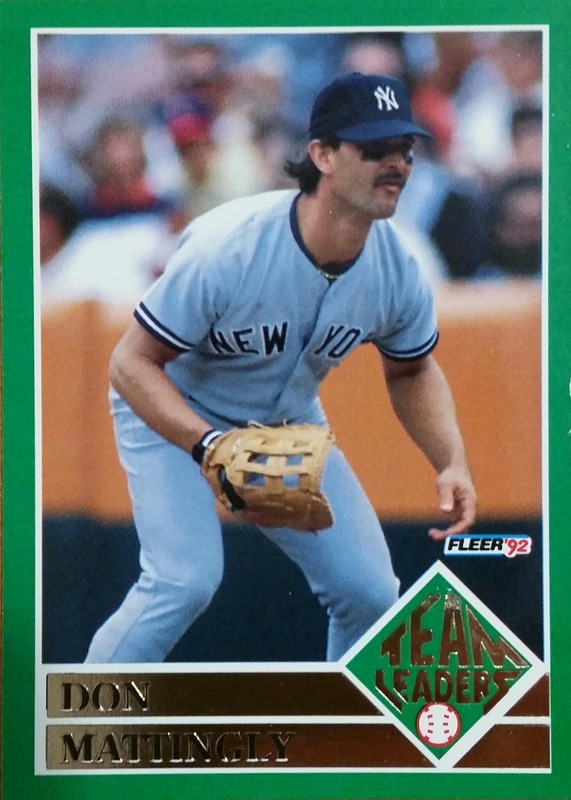 Usually not a fan of borders on cards, but this kind of border with the floor and color scheme is more like a picture frame around the action shots. 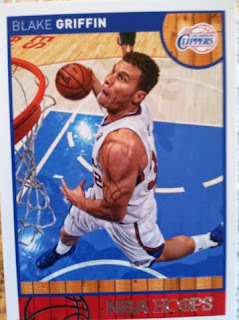 There are some amazing camera angles on these just look at the Blake Griffin above.This is not the only one that has this kind of action either. 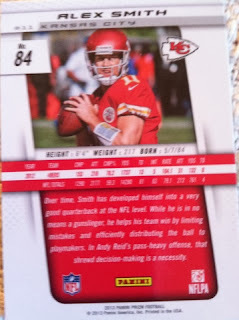 A pack alone comes packed with these base cards. There are around 3 rookies from this years class and 20 or so inserts per pack. 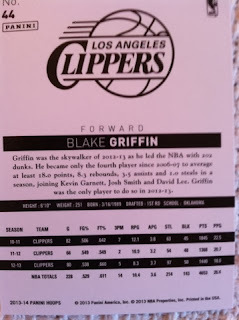 The rest are base cards. 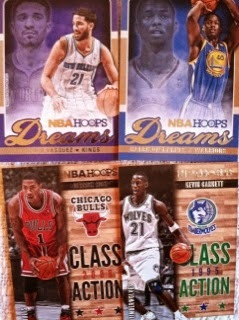 This kind of break is a set collectors dream. 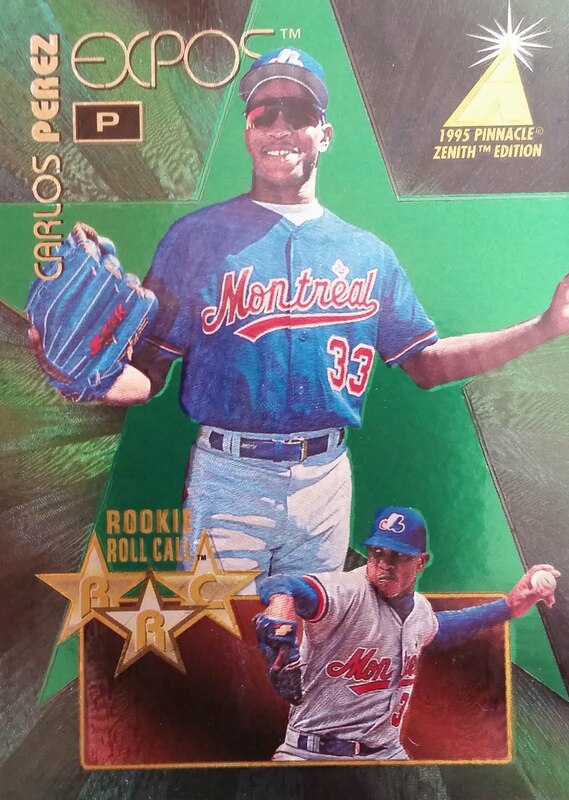 There are 40 Rookie Cards in the 300-card base set. So in terms of a set collector, this is the way to go. Whether you want to aim for a base card or a insert set. The designs this year are also done well. 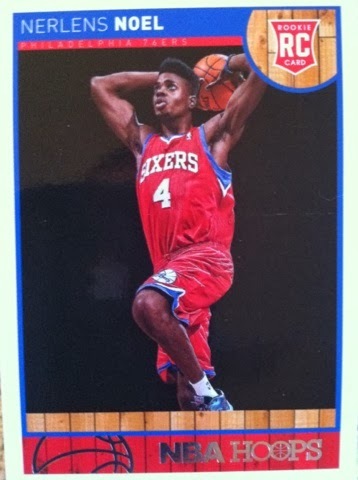 You have some with parallels such as gold and Artist’s Proof Black 1/1's, some with action photography such as Courtside and Above The Rim, some that are rare such as Kobe's All-Rookie Team, some that have a throwback appeal. Here is the Miami Heat Champions Sp which is card #301 in the base set. 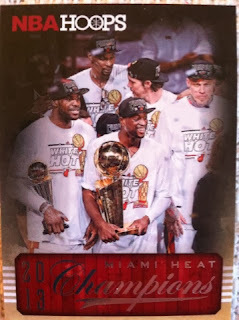 You can also look for ultra-rare Highlights cards, featuring the best highlights of the 2012-13 season! Highlights include Kobe reaching 30,000 points, Steve Nash eclipsing 10,000 assists and the Miami Heat's 27-game winning streak! 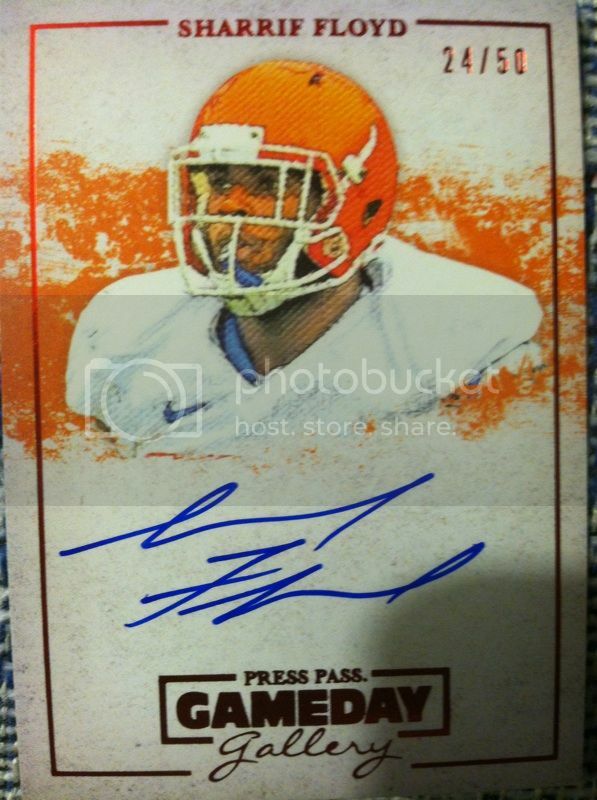 AUTOGRAPHS: I have seen a few of these breaks that come packing. This one came with a bonus autograph! The autograph checklist is big and contains both rookies and veterans. 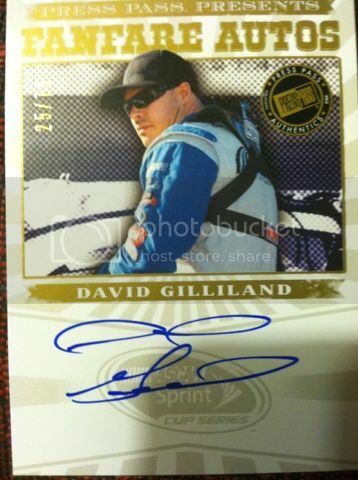 There are 200 autographs to chase in regular signatures and in the parallels of Blue and Red. 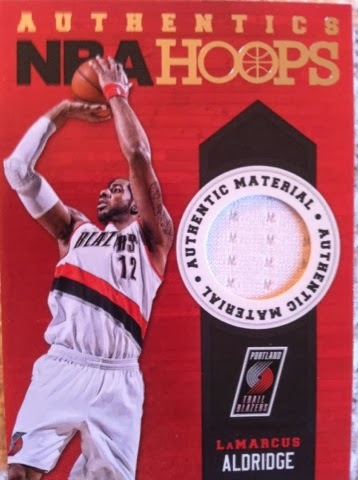 JERSEY/PATCH CARDS: Every box promises one memorabilia card. Not bad in terms of design. OVERALL THOUGHTS: Cards, cards and more cards. 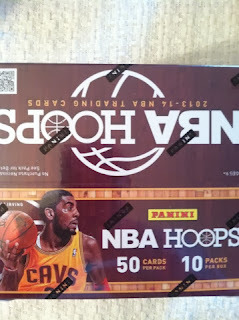 This was my thought of Hoops as I opened every pack wondering what mystery could be hidden within. Panini's first release of the 2013-2014 basketball season was a fun bust. It was just as interesting as the opening football season bust with the jumbo packs of Score football. Digging through them looking for treasures. However, we must say that this product is not for everyone. This isn't a product for huge hit thrill seekers. You won't find them here. This product is more for those who like sorting and putting together insert and base sets. Ones who collect for the fun of it and not to rip and sell. And ones looking for early rookie cards of NBA's future stars. This would also be a great product to start kids out on. 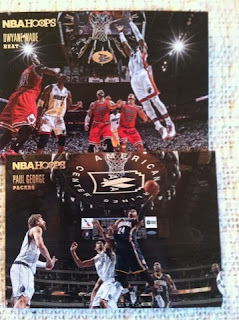 With great photography and some fun inclusions this was a great start to the new basketball collecting season. First off, man, that was a tough series to watch if you are a Yankees fan...I must say congrats to the Red Sox but at the same time..BOOOOOOOO!! Now with the series over, I gotta announce the winner of our World Series Contest. A big congrats goes out to @JdoggNoland who picked the Red Sox to win back in February. 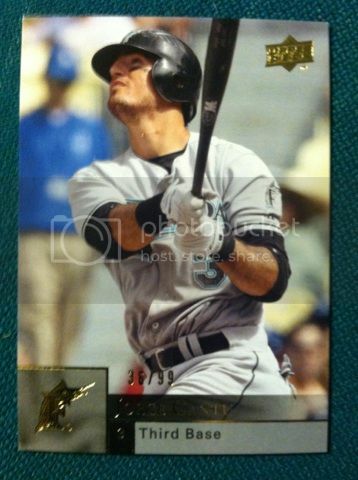 Jeff Conine Gold Parallel from Upper Deck '09 numbered to 99. 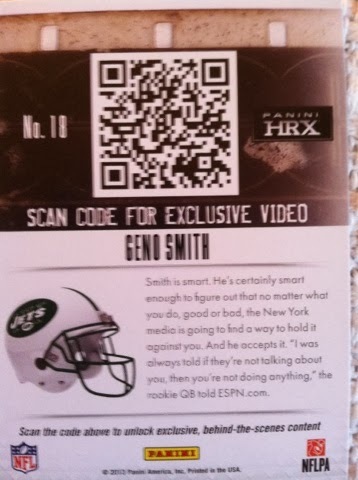 This is the Pink Error card. @JdoggNoland, please email us your address to sportcardcollectors@hotmail.com and we will get this package out to you! As for everyone else who participated in this. Thank you for participating and maybe we will do this again next year! 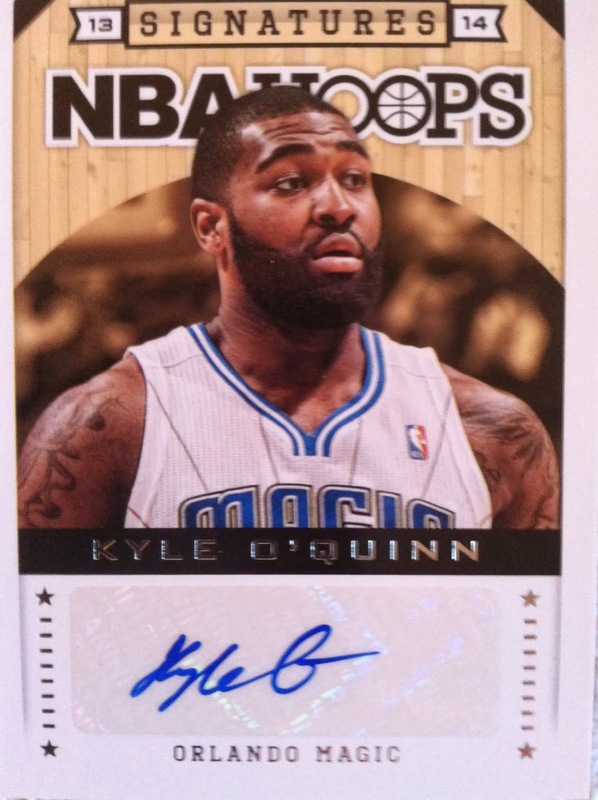 Four Autographs and 4 Memorabilia cards per box! 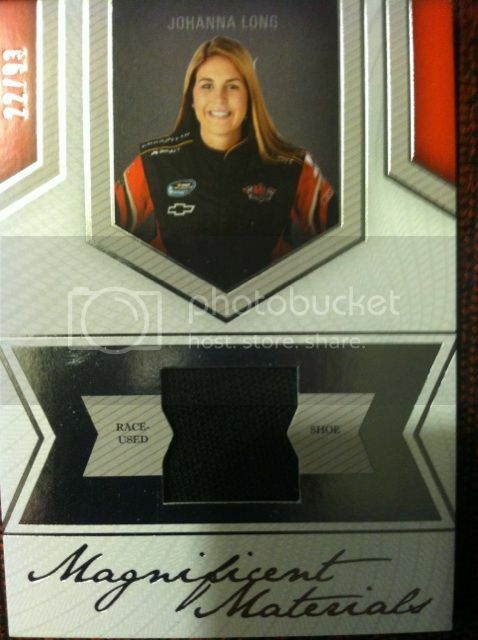 Danica Patrick & Ricky Stenhouse Jr. Rookies! 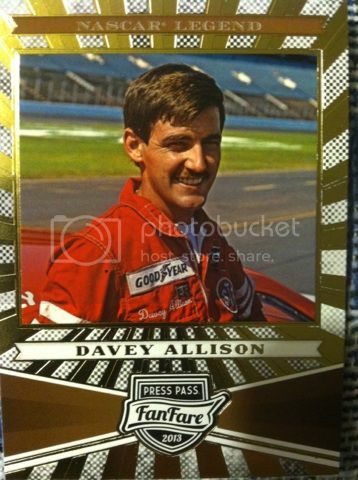 BASE CARDS: Press Pass has always been very impressive with their NASCAR products and there are not many Press Pass Racing product I don't like in terms of creativity and design. I like this design cause in NASCAR there are not too many action shots you can get with racers so most pictures are taken of the drivers themselves. So with most portraits you want to get an impressive frame for them. 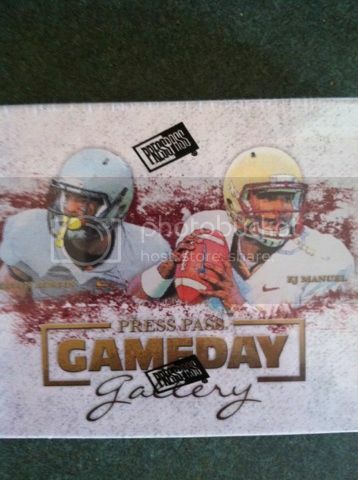 And Press Pass did just that here. 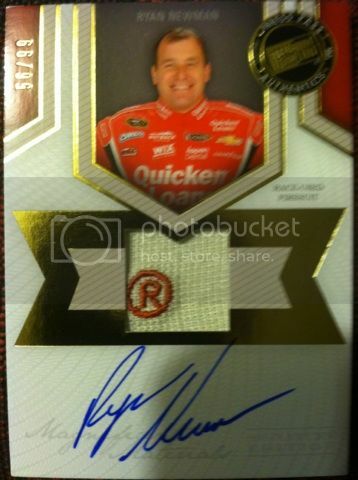 The 100-card base set features the best of Nascar Sprint Cup Series, Nascar NationWide Series, and the Nascar Camping World Truck Series. 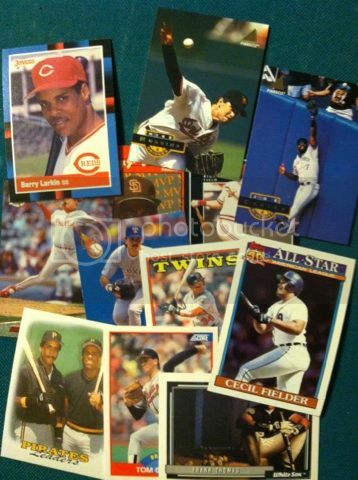 INSERTS:Press Pass sticks with their basics and to foilboard One of their favorite things to do with their inserts. The designs are not bad either. And you get about one insert, sometimes two, per pack. There is nothing wrong with sticking with something you are good at. 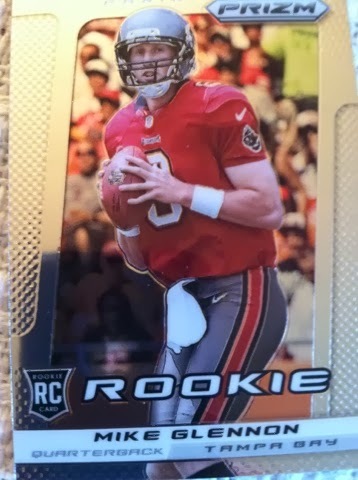 Really loved this pull! 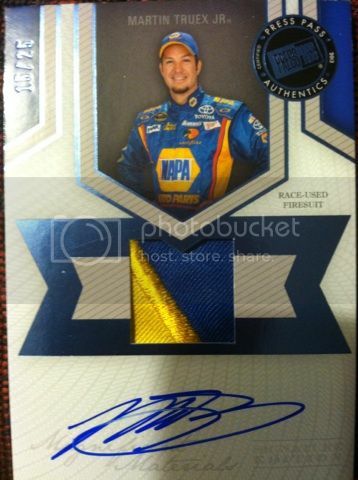 Sweet patch piece! This prime piece with an R we thought was awesome. Not to mention with his name being Ryan, this was a bonus. 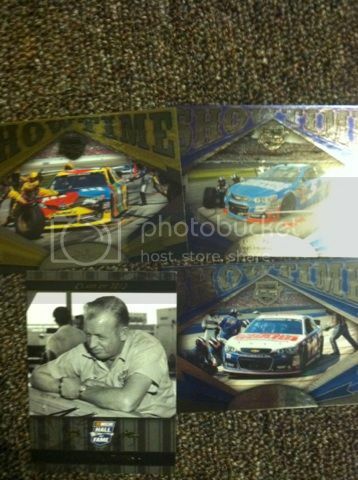 AUTOGRAPHS: Some sweet prime swatches used in the auto memorabilia cards. The Truex is cool, but that Newman with the R in it was definitely an eye getter. All of the autographs we pulled from the box are also on-card. In each box you will land 4 autographs. Overall, there are four levels of FanFare Autographs to collect. 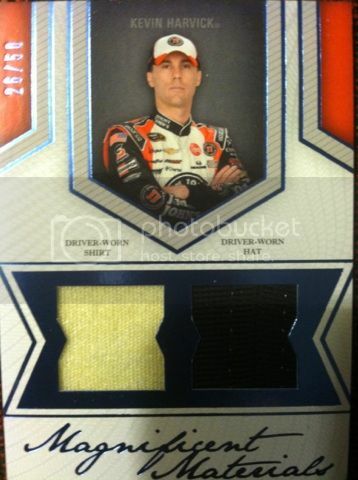 JERSEY/PATCH CARDS: The many pieces that Press Pass uses in their racing cards is an automatic win. They are very creative using Sheet Metal, Shirts, Hats, and many more. Most of these pieces you can see have been used and you will not question the authenticity. And most of the pieces are very unique and prime. 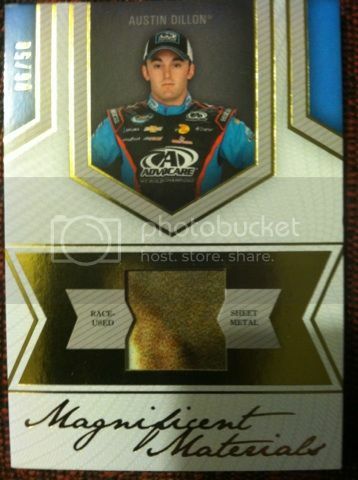 Look at the Austin Dillion above..very cool. The design is very balanced. Not too much player. Not too big of writing. And not too much blank space. 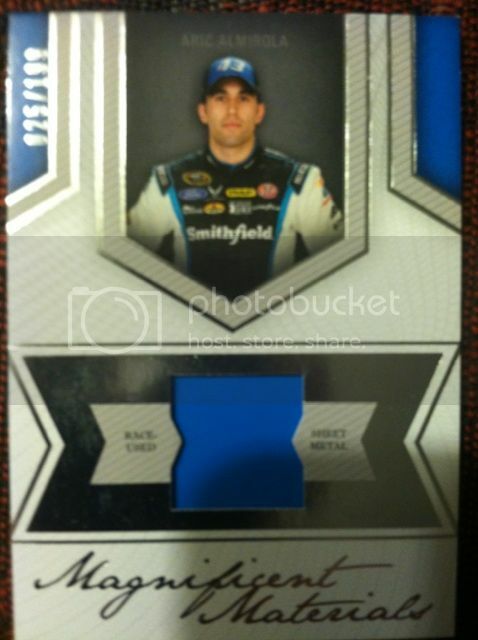 It is split up into thirds perfectly making for a nice memorabilia design that other companies should take note of. 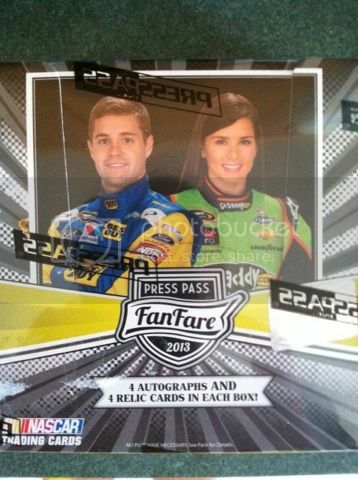 This years FanFare also has the return of Rookie Stripes featuring autographed Rookie Tape cards from Danica Patrick and Ricky Stenhouse Jr. and also has Magnificent Materials JUMBO cards featuring an oversized swatch of memorabilia. 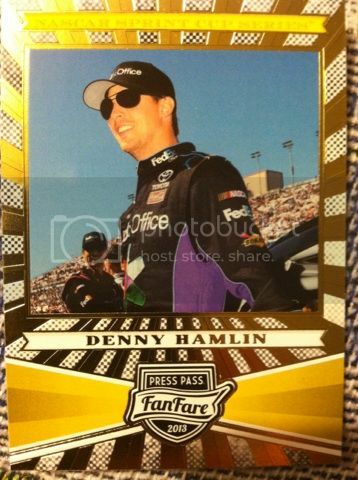 OVERALL THOUGHTS: You don't have to be a HUGE NASCAR fan to appreciate Press Pass racing cards. Design is nice. Memorabilia is creative. 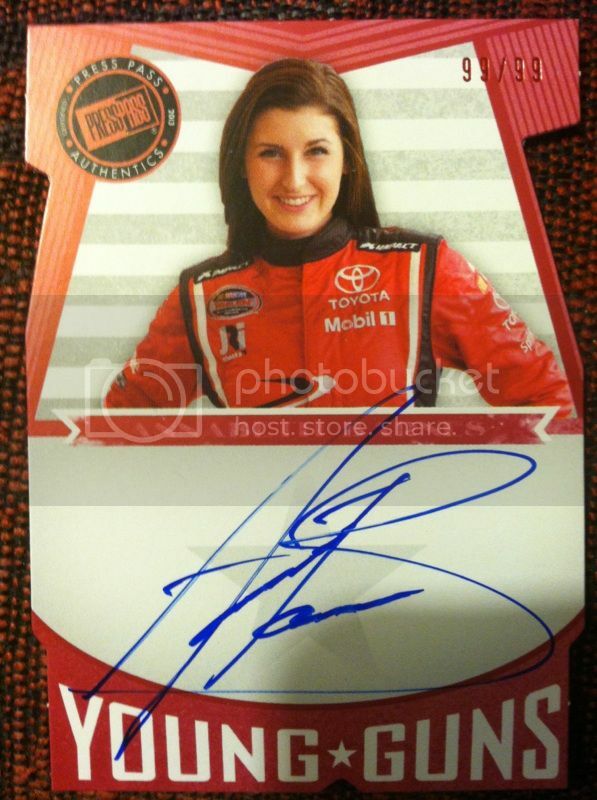 And on card autographs. 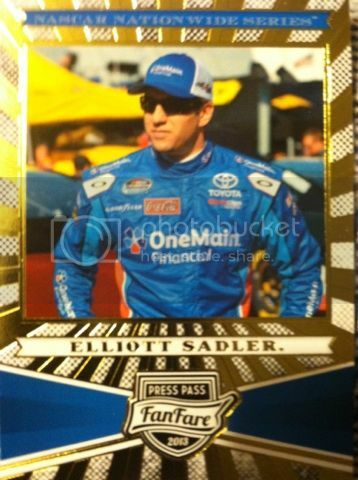 Once again, another big Press Pass racing winner that reaches the checker flag. 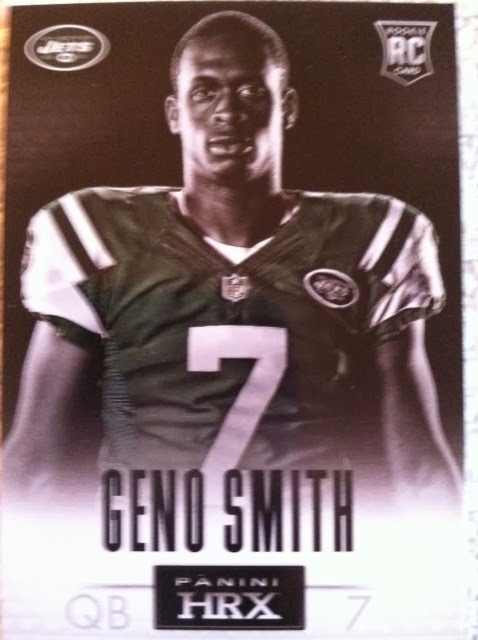 BASE CARDS:This is the third sport in a row I am having to say this but I will say it again, I really like the added color to the background of this years Prizm products. It truly takes away the dullness of the silver they used last year. I think the design is much better now. Of course another positive thing about Prizm base cards is that they don't bend. 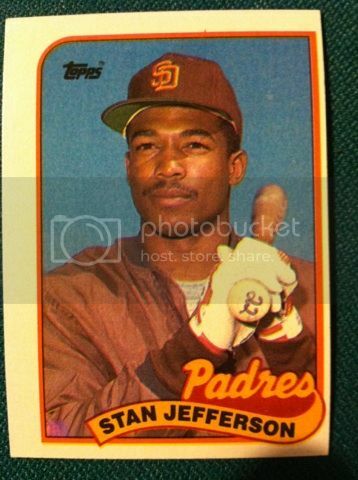 There are 300 cards in the base set. 100 of those are rookies. 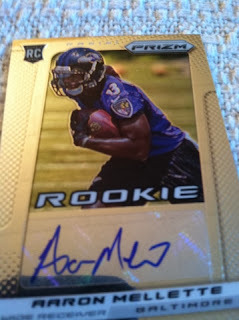 You will find one rookie card per pack and 20 per box. With such a HUGE rookie checklist you will get a good mix of stars and possible up and comers. INSERTS: The base inserts for this product are drastically improved just like the base cards due to just a slight addition of color. But with this product, it's not about those inserts. It's about the parallels. 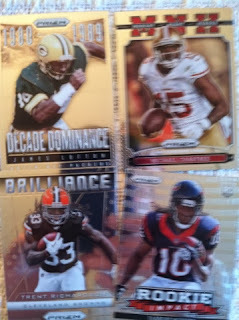 There are Prizm, Orange Prizm Die-Cut (numbered to 50), Gold Prizm (numbered to 10) and Finite Prizm (1-of-1) to be found. Our box came with the stated 3 Prizms. You just gotta enjoy a well done parallel. Also with this years Prizm parallels there are many, many to chase and not just in hobby. 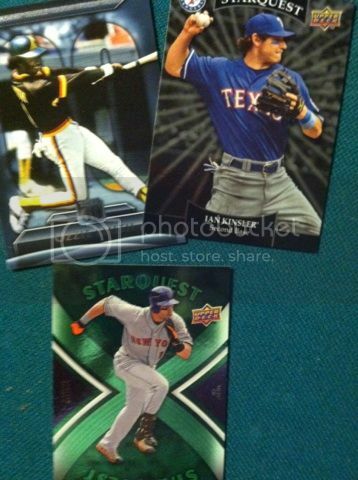 There is jumbo boxes with different parallels. And retail boxes with blue and reds. And then you have the Monster Box that comes with Monster Box found only insert parallels. 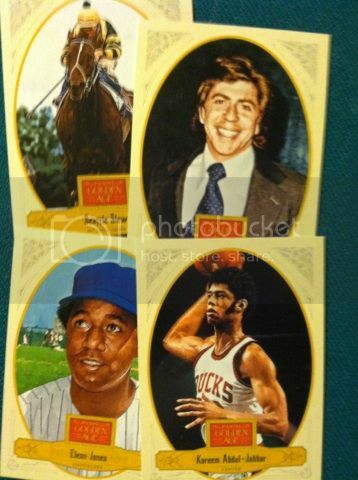 Putting together a rainbow of your favorite player or players or teams will be a fun chase. 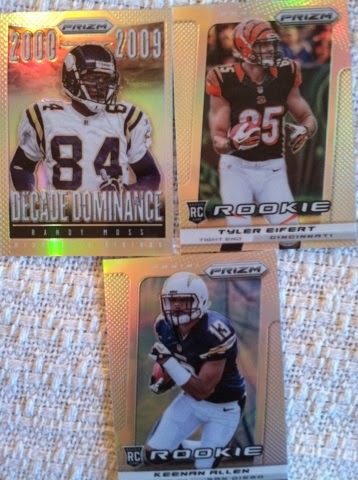 Another neat addition and per pack find is the Panini HRX cards. 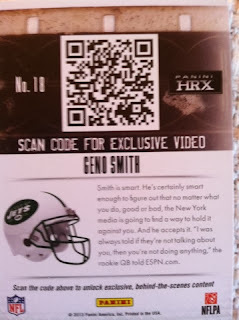 By scanning the code on the back of each of these rookies cards you will unlock exclusive behind the scenes content on your mobile device. Pretty cool. 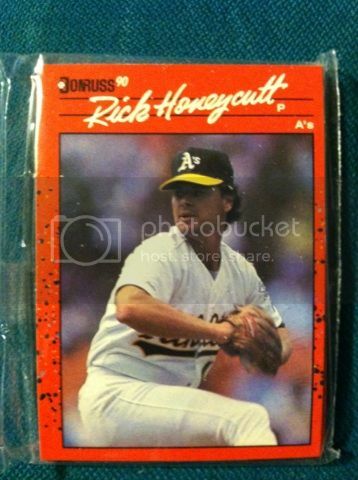 To me it's another added rookie card as well. 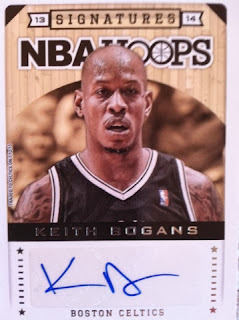 AUTOGRAPHS: There are many autographs to chase in this product mixed of veterans and rookies. 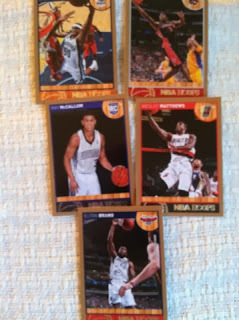 Then you have to pile the Prizm parallel ones on top of that. With such a massive checklist you could land anybody. This is either a good thing or a bad thing. Some boxes may provide some serious BOOM with stars and others may feel a little flat like this box did. 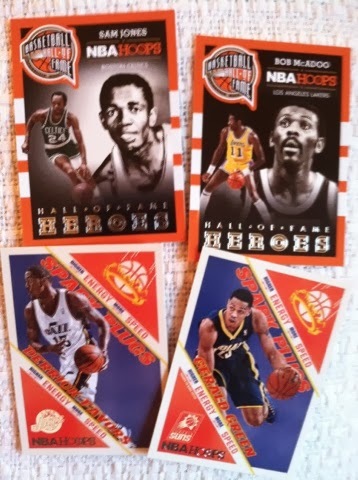 I would have liked to seen one rookie and one vet per box making the chances and value a little better. The McDonald above is a Prizm parallel auto numbered to 99. OVERALL THOUGHTS: As the saying goes, you can't judge a book by it's cover, well you can't judge a box by it's break. This was honestly a little bit of a rough break for the price you pay for it. 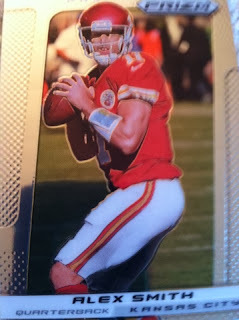 Weak autos and no big parallel hits. 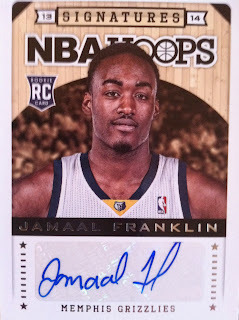 With only 2 hits per box you are relying on one of those hits to bring you some value back from your break. Not unless you are lucky enough to hit it big time in the parallel department. Don't get me wrong, I truly love Prizm. I like it as much as it's Chrome opponent. The design and parallels are fun. 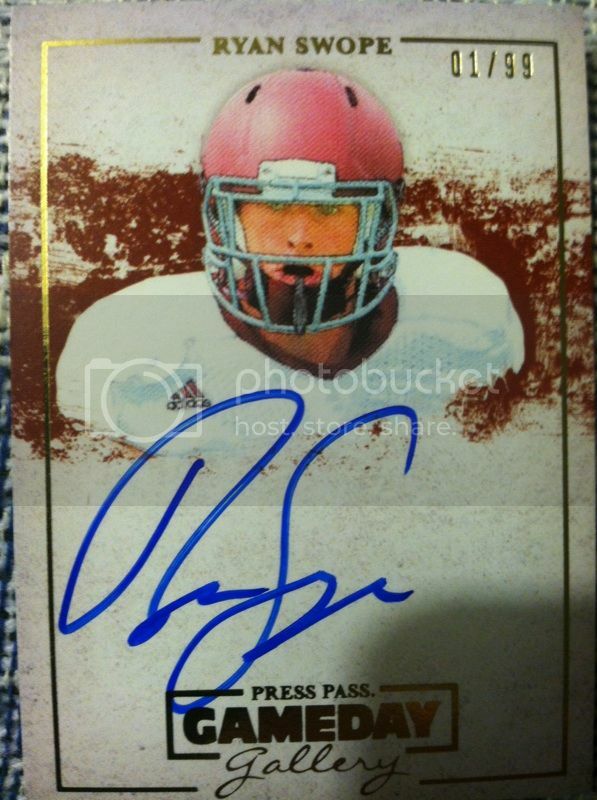 And with more vet autos this year in a weak draft class its a nice addition. I do wished this box added more value to what you pay for it, but like with any box in this hobby, it's all a risk. 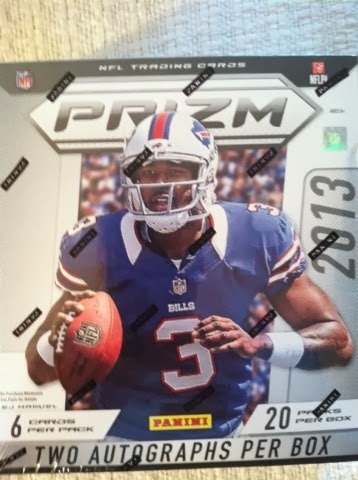 Prizm is a great product and you can't let just one bad break be the deciding factor for you. Try it for yourself and let us know what you think. AUTOGRAPHS: Usually products that have no helmet logo's are a definite turn away for us then you add on the artsy look and you will most likely have a product we stay away from. But something about the design with these worked. And it helped take the focus off from the decaless helmets. It might also help that the product comes packed with Sp variations with players without helmets. 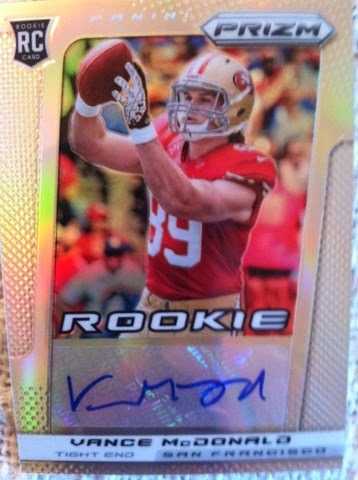 And the different colored ink players signed with is pretty cool as well. 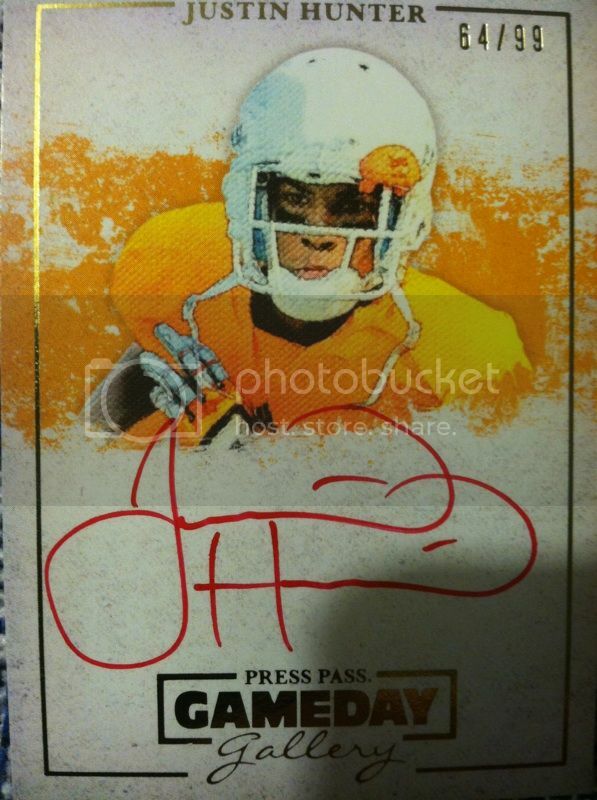 The design is well done and helps the autographs stand out. As for the signatures themselves, they are ALL on-card which I know makes collectors happy. I also like how big the autographs are. 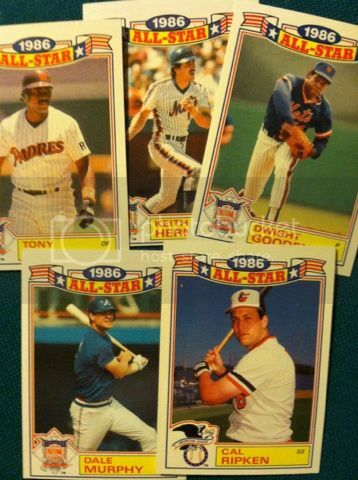 Instead of a small sticker auto, these bad boys completely stand out at you. OVERALL THOUGHTS: You won't find many boxes for under $50 with 4 hits in them. Though this product only gives you those four cards all hits. There are some great autos to find in Smith, Barkley, and Manuel to name a few and all of the autographs from the product are numbered which helps their value. 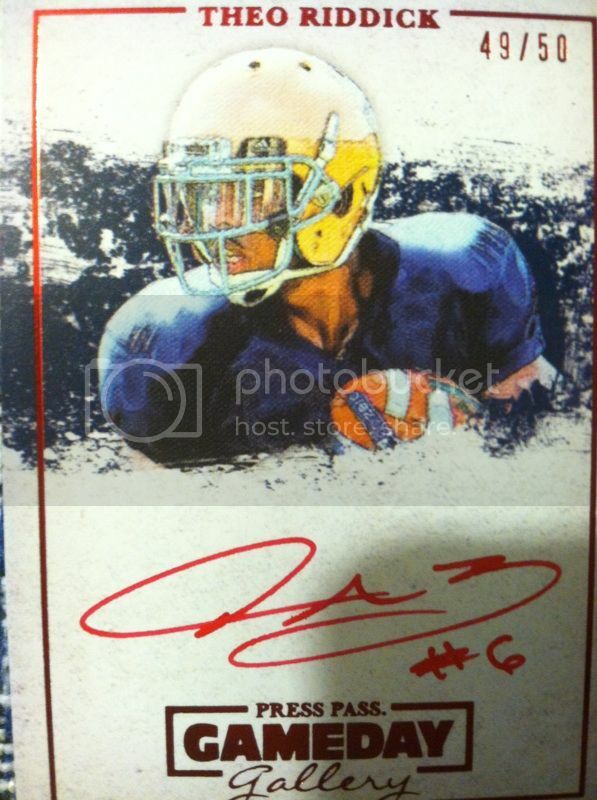 Not to mention, on card autos. 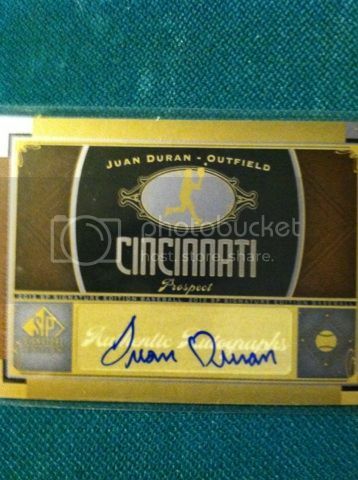 Though we didn't hit it very big in our break, you just never know and for the price vs. possible return we say why not bust one? Winner Of The BCW Prize Pack! WIN a BCW PRIZE PACK! Player Of The Day # 7-NEWBIE DAY! !